A chronic criticism of Chicago’s art landscape is that, for a thriving urban center, its art venues and exhibitions spaces are too farflung across the city’s grid, and therefore largely inaccessible. A Chelsea-type stroll just isn’t possible in Chicago, and even if there are concentrated gallery districts in River North and the West Loop, they scarcely represent the full spectrum of the city’s visual art production. Our art scene has multiple centers with as many margins, and therefore many frontiers. 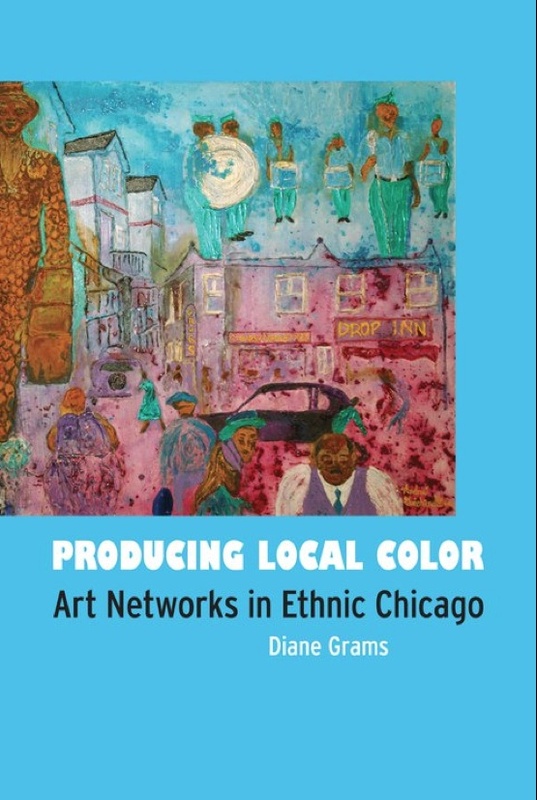 Diane Grams’ new book, “Producing Local Color: Art Networks in Ethnic Chicago,” argues that Chicago’s island neighborhoods benefit from autonomous art production and consumption. The book offers three case studies—the Chicago neighborhoods of Bronzeville, Pilsen and Rogers Park—to describe how locally cultivated art scenes exist in relation to specific local issues, from real estate to crime, and to larger concerns of politics, civil rights and economic access. A common tactic in Chicago, especially today, is the domestic gallery. In 1961, several people decided to start a “home-based museum” on the South Side and called it the Ebony Museum to represent black history in Chicago. Twelve years later they moved locations and changed the name to the DuSable Museum of African American History. This boldly innovative museum only became culturally legitimate and publicly influential, writes Grams, when the institution was relocated into the city’s parkland alongside other major cultural institutions. Not all alternative or independent spaces aim for non-profit or institutional status. Elsewhere on the South Side, in Bronzeville, a commercial gallery district emerged to cater especially to black artists and patrons. The spaces mirrored the clean-white-wall style of other professional galleries, but the art shown there addressed specific issues of identity and culture linked to race, or “black aesthetics.” Any commercial gallery, no matter its product, needs a collector network to survive, but as Bronzeville residents have not historically sat on the boards of the city’s major art museums, a collector class was nonexistent in this part of town. To remedy this, middle-class collectors were cultivated, and a grassroots movement to educate people about art, and the importance of having art in the home, rapidly grew. Grams’ chapter on the emergence of the “contemporary black middle class” and its engagement with contemporary art is an important contribution to Chicago art history. With anecdotes from local patrons and artists, it reveals how art collecting became “an extension of civil rights efforts,” providing an alternative to the distribution of cultural power and knowledge usually reserved for the downtown elites. The wider implication is that this case study is an excellent example for new groups looking at how to engage new audiences with art. The other two case studies, of Rogers Park’s bohemian and leftist legacy, and Pilsen’s bifurcated art scene (on the west, a celebrated Latin heritage, and on the east, the Podmajersky real estate/gallery district inhabited by recent art-school grads), relate significant histories of staunchly independent scenes. The Chicago Arts District in Pilsen, or “Podville,” notes Grams, after its principal owners the Podmajersky family, is a banner that exists simply as a way for artists to maintain their autonomy, like a band of refugees. Ultimately, though, the Podville residents, who do not value sales as a measure of validation, are typically fleeting, their legacy remaining only as shared oral histories. In Rogers Park, the newly emergent art scene also depended on the creation of art-specific venues, which of course is linked to real estate and the threat of gentrification. Here, Grams does an excellent job of explaining how the community came to terms with the purpose of a new local arts district. The book’s author, although she is a painter, does not tackle these topics through the usual art-historical or critical lens, but rather as a cultural sociologist. Her method is observational and her writing tends to be scientific rather than flashy or theoretical. This is a refreshing perspective, like an economist explaining the art market or a chemist detailing an artist’s media. As the local politics and ethnic identities of each case study is so specific, Grams’ micro-lens produces a realistic picture of the city at each turn. Although the material is straightforward, the author’s findings are edifying. “Producing Local Color” is required reading for anyone seeking to understand why Chicago’s many art scenes feel disconnected or scattered. As each locale strives to find an alternative to the dominant culture, it becomes clear that such a search for alternatives, led by disparate groups of minorities, is the norm itself. Some would call this hard evidence of postmodernism; others will call it lived experience.